a) From 59 days (group booking on the basis of multi-bed rooms) or 44 days (group booking on the basis of single and double rooms) to 30 days prior to arrival, 30 percent of the agreed booking price is payable. b) 29 to 10 days prior to arrival: 50 percent of the total agreed booking price is payable. c) 9 to 1 day(s) prior to arrival: 80 percent of the total agreed booking price is payable. d) In the event of a cancellation on the day of arrival or non-utilisation of the service, 90 percent of the total agreed booking price is payable. e) If the number of persons falls by more than ten percent within these deadlines, the above cancellation charges for the cancelled persons will apply accordingly. Up to ten percent of the number of persons may be cancelled free of charge up to one day prior to arrival. Unless otherwise agreed, for groups of twelve persons or more a payment of 10 percent of the total booking price shall be due immediately on confirmation of the booking. Unless otherwise agreed, the remaining amount will be due no later than four weeks prior to arrival without the Hotel issuing a separate payment reminder. In the case of group bookings booked less than eight weeks prior to arrival, the first advance payment of 10 percent shall not apply and the total booking price will be due in full in advance immediately on confirmation of the booking. PLEASE NOTE: For bookings of several beds in dorms, we do not guarantee accommodation in the same room. We do not guarantee the room size of 7 beds when booking a bed in a big dorm. Booked catering services may be cancelled free of charge up to eight days prior to arrival. Thereafter, a cancellation fee of 100 percent of the agreed price will be payable. Meininger is all about convenience. It's situated only two minutes from the Sloterdijk Railway Station and only 15 from the airport. 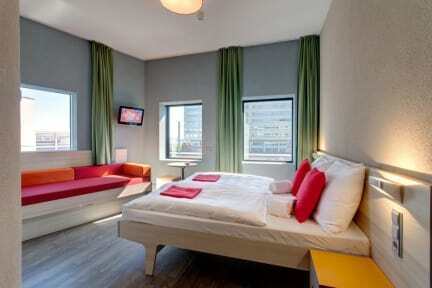 Its rooms are comfy, clean and affordable; all you'd need for a stay in Amsterdam. Obviously, it's Europe's premier party town and the Meininger bar is the perfect place to warm up before a night out. Grab an ice cold local beer from Amsterdam or deuce is out with fellow internationals on the football table. The hostel is situated directly (almost next door) at the Sloterdijk transport hub and is just 5 minutes from the main railway station with the urban railway. The perfect starting point to explore every corner of Amsterdam! We are located right at the second most important urban transport hub in Amsterdam: Sloterdijk station. At Sloterdijk Station ALL public transport is covered (trains, trams, busses, metros) to get you wherever you need to be in Amsterdam. From here it is just a 5-minute ride with the urban railway to Centraal Station at the heart of the Old Town and fifteen minutes to Schiphol Airport. The Westerpark is within easy walking distance. We have a breath of Amsterdam flair in store for you here, with Old Master-style art in the lobby and giant clogs before the door. In addition to interesting conversation, our bar also offers cool local beers and other local specialities. Snacks are also available here, should you feel peckish. Sometimes you're simply spoilt for choice. If you cannot decide which of the numerous Amsterdam restaurants to choose, you can rustle up something tasty for you and your friends in the guest kitchen. By the way: this also has a washing machine and dryer. In our games room pool and table football await, either for internationals against other guests or a game amongst friends. The cosy alternative: you put your feet up in our comfortable lobby and chat with friends from home. Free Wi-Fi is provided in all public areas and rooms. Beds are located in either single, double, multi-bed rooms or the dormitory. Bed linen is included. All rooms have an own bathroom with shower and toilet, as well as a television. Our young, multilingual team is on hand for you 24 hours a day. We look forward to seeing you! 7% of the accommodation costs, must be paid on arrival at the hotel. Earliest check in time is 3pm on arrival date for all MEININGER properties. Of course guests can arrive before 3pm and leave their bags in our luggage room if required. Our young and multilingual team is there for you 24 hours a day with help and advice. Under such circumstances, there is really nothing stopping you from having an unforgettable stay! We accept payment by VISA, MASTER, EC Maestro, Cash, Transfer. a) For cancellations made 59 to 30 days before expected arrival, 30 per cent of the agreed-upon total price will be due. b) For cancellations made 29 to 10 days before expected arrival, 50 per cent of the agreed-upon total price will be due. c) For cancellations made 9 to 1 day(s) before expected arrival, 90 per cent of the agreed-upon total price will be due. reduction of less than 10 per cent is free of charge until 1 day prior to arrival. Super service, tout était propre, les déjeuners étaient très bons, les employés étaient très gentils, seul défaut est que le micro-onde a brisé et nous ne pouvions plus l'utiliser et les ronds de cuisine ne fonctionnaient pas tous. Accueil chaleureux, chambre propre et bien agencée, petit déjeuner très copieux et diversifié, emplacement au top pour rejoindre le centre d'Amsterdam!!! Meininger is all about convenience. It\'s situated only two minutes from the Sloterdijk Railway Station and only 15 from the airport. 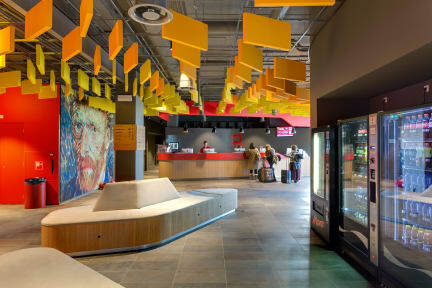 Its rooms are comfy, clean and affordable; all you\'d need for a stay in Amsterdam. Obviously, it\'s Europe\'s premier party town and the Meininger bar is the perfect place to warm up before a night out. Grab an ice cold local beer from Amsterdam or deuce is out with fellow internationals on the football table.